(11.4 to 18.9 litre) tea batches. 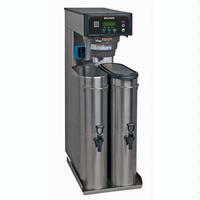 dispenser and serve up to 6 gallons (22.7 litres) within a narrow footprint. narrow tea dispensers (can also brew directly into standard tea dispensers). nozzles and brew selection switch. dispenser and choose the correct selection. Three recipe buttons and full/half options for maximum flexibility. Includes two button graphic overlay for customizing the user interface. Digital temperature control, pre-infusion, pulse brew and cold brew lockout. Left side preset with sweetener valve. Each brew button’s sweetener may be independently set and easily adjusted using the Sweet Meter. “Out of Sweetener” indicator - LCD blinks to aid operator. Separate inlet for sweetener - use existing CO2 systems or external third party pump for sweetener delivery.